In RUNES OF MAGIC - SHAREENA my main character has a pet, a ferret. This adventureous little thief got his name as an hommage to one of my favorite heroes in cinema history: Indiana Jones. Now, why a ferret? In 2004 a friend of mine, the famous concept artist Daniel Lieske, and I were talking about a squirrel. I remember, Daniel had one right in front of his window, living in a tree. 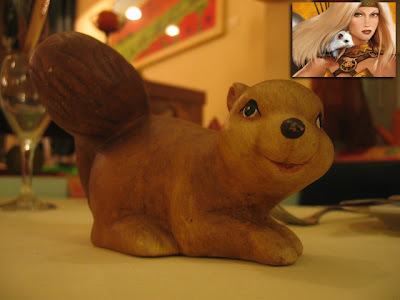 A few days later, my wife and I went to a restaurant, the Landhaus Ruhenstroth in Gütersloh, Germany, where they were setting up the autumn decoration and they had this clay squirrel models on the tables.By the way, this restaurant is a secret tip for one of the best cuisines you can find, especially if you in for really excellent steaks;-) Check it out! RUNES OF MAGIC. The game already had a pet system and here I remembered our squirrel. I put the characteristics, being bold and curious, into Jonesy, Shareenas ferret.